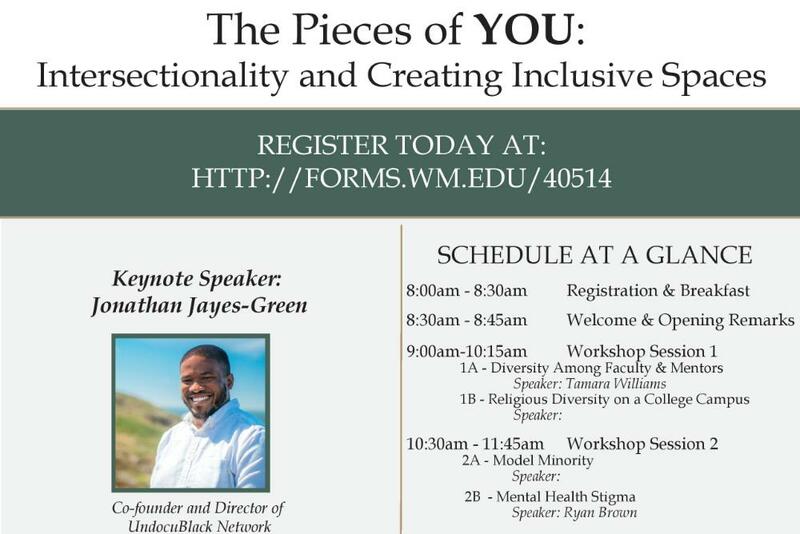 The second annual Diversity & Inclusion Symposium will be a day-long event focused on advancing the conversation on intersectionality and creating inclusive spaces in higher education. All students, including those from our professional schools should attend. The symposium is free thanks to a generous gift from Ernst & Young. Participants must register in advance. Breakfast and lunch will be provided. Featured Speaker: Jonathan Jayes-Green, Co-Founder and Director of the UndocuBlack Network (UBN), a multigenerational Network of Black undocumented immigrants organizing their own communities and building power. UBN focuses on organizing, deportation defense, advocacy, wellness and storytelling. Jonathan believes freedom and liberation is possible by organizing and centering the voices and leadership of those directly impacted. Jonathan is a queer undocumented Afro-Panamanian DACA recipient who loves salsa, merengue and heartfelt hugs. He has been the recipient of the 2019 Haas Jr. Outstanding LGBT Leadership on Immigration, American Immigration Council?s Immigrant Youth Achievement Award, the Hispanic Heritage Foundation?s Inspira Award and the Frederick Douglass 200 List by the the Frederick Douglass Family Initiatives and American University?s Antiracist Research and Policy Center. Jonathan received his Associate?s from Montgomery College (MD) and his Bachelor?s degree in Sociology from Goucher College. He comes into this work having served as liaison and advocate of the Caribbean and Latinx communities in the office of the Governor of Maryland, having won state-wide legislative fights like the Dream Act and marriage equality, and having supported a women of color-owned small business in its growth and development.